The Advanced Technology and Projects group that Google has inherited from Motorola is proving to be a great headline generator for the company. It's biggest claim to fame so far is in being the team behind the modular phone Project Ara. But, the group is also responsible for the 3D mapping ideas in Project Tango; and, a new report says Project Tango is getting expanded with a tablet. 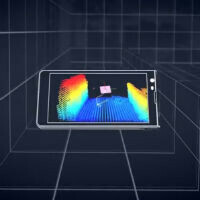 If you don't remember, Project Tango was unveiled back in February, and consists of a smartphone that uses dual rear cameras, infrared depth sensors, and two "computer vision processors" in order to generate a real-time 3D map of the space around the phone. Now, a report from The Wall Street Journal says that Google is working on a 7-inch tablet version of the device that will include the same set-up for capturing a 3D image of an area. Google is apparently planning on producing 4,000 prototypes of the tablet beginning next month, and may release the tablet just before Google I/O at the end of June. This would be a major expansion of Project Tango, which only saw 200 phones released when it was revealed back in February. Google has only hinted at the possibilities of the project, which include improvements to indoor navigation to aid the visually impaired; but, the technology has much more far reaching implications which can be hard to predict. We're sure we'll see more about it at Google I/O, so keep a lookout. Yeah, I was sad about the Motorola sale as well, but Google has it's own path and goals and them holding onto Motorola Mobility was not something Google was interested in. But with all the unique things that Google's been doing recently Like Android Wear, Google Glass, Chrome OS, Projects Tango, Loon, Ara, Google Fiber, Driverless cars, I think they'll end up being one of those rare companies that change how to world works.